By Jim Dower: Former heavyweight world title challenger Luis ‘King Kong’ Ortiz (29-1, 25 KOs) will be fighting on the undercard of Deontay Wilder vs. Tyson Fury on December 1, likely against Premier Boxing Champions stable fighter Travis Kauffman (32-2, 23 KOs, according to ESPN. Kauffman isn’t considered to be in the same league as Ortiz, to this fight will have a high chance of ending early in the first could of rounds. If Ortiz comes out smoking on December 1, Kauffman will probably fold right away like he did in his early knockout loss to Tony Grano nine years ago. Ortiz, 39, is trying to get himself in position for a rematch against Wilder after being knocked out by him in the 10th round last March in Brooklyn, New York. 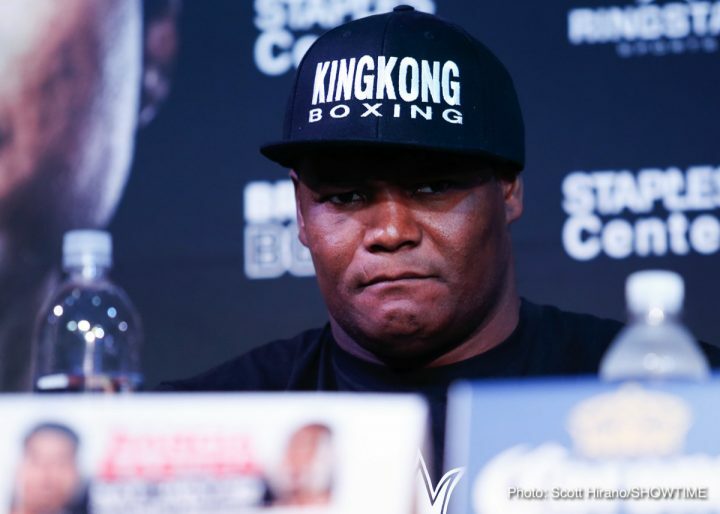 Ortiz looked great in his last fight, stopping former heavyweight world title challenger Razvan Cojanu (16-4, 9 KOs) in the 2nd round on July 28 at the Staples Center in Los Angeles, California. Ortiz easily stopped the 6’7″ Cojanu, who had given former World Boxing Organization champion Joseph Parker all kinds of problems last year in May 2017. With the Cuban star Ortiz facing Kauffman, this is bad news for boxing fans that were hoping that Dillian Whyte would be facing Luis on December 22 in London, England. Ortiz was one of the options for Whyte’s fight. However, it doesn’t appear that Ortiz was ever seriously considered for the Whyte fight by British promoter Eddie Hearn, who heads the Matchroom Boxing USA/DAZN stable, as he was cool to the idea of a Whyte-Ortiz fight from the very start. Whyte and Ortiz had exchanged words, and Ortiz had made it clear that he wanted the fight. But from the very start, Hearn didn’t sound excited at letting Whyte take the fight. It looks like Ortiz’s management gave up on waiting for a phone call that was never going to come from Hearn. To be sure, Hearn has deep enough pickets to have signed Ortiz for Whyte to fight on December 22 if he had wanted him for the fight, but the British promoter has other ideas of the type of guy he wants Dillian to fight on that date. A talent like Ortiz likely was never given any serious consideration by Hear. Whyte is a good fighter, but not someone who would be favored against a guy like Ortiz. Kauffman, 33, is coming off of a 10 round majority decision win over Scott Alexander last June. Before that fight, Kauffman had lost to 46-year-old Amir Mansour by a 12 round majority decision last year in March 2017. Kauffman’s only other loss is a 4th round knockout to Tony Grano in September 2009. Kauffman’s loss to Mansour gives a strong indication of his limitations as a fighter. Mansour was recently destroyed by Filip Hrgovic by a 3rd round knockout last December. In 2016, Mansour was stopped in the 5th round by Dominic Breazeale. Kauffman is a good heavyweight, but he’s clearly a non-top tier level fighter. You’re not going to be able to exist with a fighter like Ortiz if you’re not a top tier level guy.